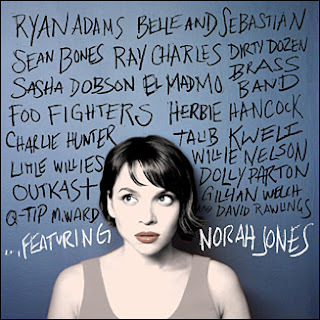 I've adored Norah Jones and her music ever since she burst onto the scene in 2002. Her soothing, soulful voice and unique, bluesy sound have captivated audiences for years. Jones' latest release, "...Featuring", is a compilation of her collaboration with various musicians between the years 2001 and 2010. The CD is diverse and entertainingly robust. "...Featuring" is chock full of musical giants including Ray Charles, Dolly Parton, and the Foo Fighters, and Jones excels at holding her own alongside each of them. I received this CD to review just prior to leaving for a vacation in Florida. It couldn't have come at a better time. I had ample time on the plane, at the pool, and on the beach to give it a good listen. "...Featuring' offers something for everyone. The selections are varied, including country (with Willie Nelson and Dolly Parton), rock (with Ryan Adams, Belle and Sebastian, and the aforementioned Foo Fighters), and hip-hop (with OutKast, Q-Tip, and Talib Kweli). Both avid and new Norah Jones fans will revel in the rich and varied musical offerings of "...Featuring". Some of my favorite songs include, "Little Lou, Ugly Jack, Prophet John" (featuring Belle and Sebastian), "Baby It's Cold Outside" (featuring Willie Nelson), and "Creepin' In" (featuring Dolly Parton). The CD wraps up with a remake of Linda Ronstadt's "Blue Bayou". It is a perfect way to end a spectacular CD. Disclosure: I received a complimentary copy of "...Featuring" to review as part of a campaign for the One2One Network. All opinions expressed herein are strictly mine and are based on a comprehensive review of the CD. For more information on my Disclosure Policy, click here. I haven't listened to this CD, but this makes me want to!